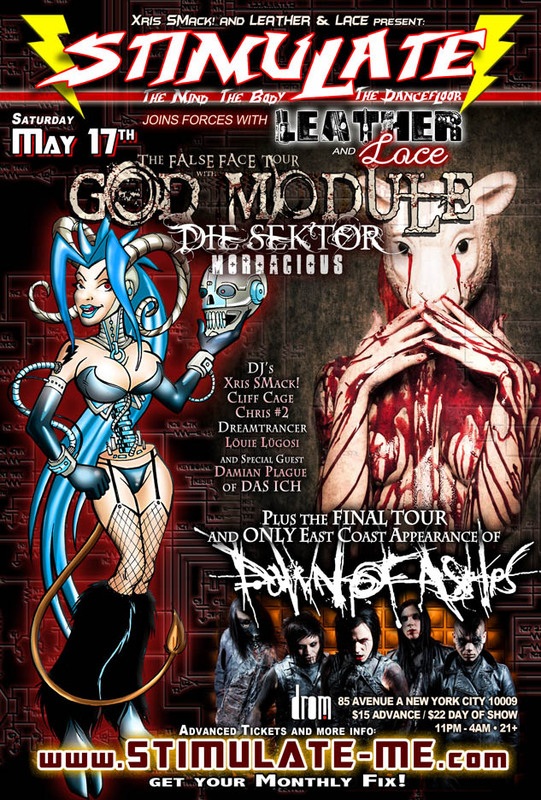 05/17/14 – STIMULATE + LEATHER & LACE present the False Face Tour w/GOD MODULE, DIE SEKTOR and MORDACIOUS live, plus the Final Tour and only East Coast show of DAWN OF ASHES! STIMULATE + LEATHER & LACE present the False Face Tour w/GOD MODULE, DIE SEKTOR and MORDACIOUS live, plus the Final Tour and only East Coast show of DAWN OF ASHES! GOD MODULE, DIE SEKTOR and MORDACIOUS all return once again to STIMULATE! :Chris #2, Cliff Cage, Damian Plague, Dawn of Ashes, Die Sektor, God Module, Mordacious, Xris SMack!